How important were the Janissaries to the Sultan and in effect to the Ottomon Empire? They were result of a clever, pragmatist strategy of the State. Turkish Empire used to convert young PoWs instead of killing them as other empires did. They had no family, no childhood or any reason to work for their personal interest. Although my previous sentence sounds very cruelly; they used to have very respected place in the State and they had chance to promote to the second highest position of the State, to the position of Sadrazam or Grand Vizier. The Sultan used to identify himself as a janissary and he was the 1st private of the 1st company ("orta" in Ottoman Turkish) traditionally. Ideology of the traditional Ottoman State system was a sense of justice based on Islamist teology. They used to believe they were spreading justice (adalet) to tyrannic regions (like bringing democracy to undeveloped lands today :/ ). And they had no national sense. They did not recognise other states as "states". In Ottoman Turkish their empire had no name. They used to identify the Empire just as "The Supreme State" ("Devleti Ali"). And the janissaries were the children who find the justice of the State according to them. Janissaries were a successful outcome of that ideology. 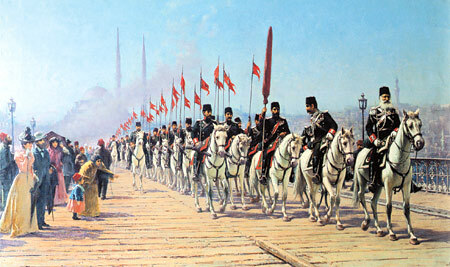 They were self-sacrificing soldiers on the battlefield and Ottoman Empire built her military structure on that idea. Did Janissaries end with the Ottoman state? or before the end? Why exactly did the Ottoman state fall apart?